Payment is due and will be charged in full at time of booking. At least 60 days notice is required to receive a 100% refund. No refunds for reservations cancelled without 60 days notice. ROCKING H. SAFARI RANCH/TEXAS SAFARI RANCH RENTAL RULES1. SmokingNo smoking of any kind (cigarettes, cigars, pipes, etc.) is allowed on the Property inside or outside due to fire restrictions.2. VisitorsPersons other than those in the guest party, may not stay overnight in or on the property. Visitors in or on the property are the sole responsibility of Guests. 3. RisksRocking H. Safari Ranch is privately owned; the owners are not responsible for any accidents, injuries or illnesses that occur while on the premises or using its facilities. The Owners are not responsible for the loss of personal belongings or valuables of guests. By accepting this reservation, it is agreed that all guests are expressly assuming the risk of any harm arising from their use of the premises or others who they invite to use the premises.4. FurnishingsPlease keep the property and all the contents in good order as if it were your own. Coasters have been provided – please use these with drinks on all wood surfaces.5. AppliancesOnly use appliances for their intended uses and place them clean and back in storage as you found them. 6. Pets are NOT allowed at any time on the property.7. Vehicles and ParkingThere is ample area for parking – if you have a boat you may park it on the property. No RV’s, ATV’s, or 4-Wheelers are permitted at any time. 8. HousekeepingThere is no daily housekeeping service. While linens and bath towels are included, daily maid service is not included in the rental rate. There is a washer and dryer available for guest use. If a longer stay requires housekeeping services, arrangements can be made with the property manager (additional cleaning fee will apply).9. Fireplaces and FiresThere is a wood burning fireplace and fire pit at the log cabin, and a wood burning fireplace at the bunkhouse. Please do not place any paper or other combustible materials in the fireplaces. Fire starting materials are provided. Always secure fireplace area prior to retiring for the night. Please do not light any candles.10. Water and Septic SystemDomestic water is provided by a well on site and each structure has its own septic system. The septic system is very effective however it will clog up if improper material is flushed into the system. PLEASE DO NOT FLUSH feminine products or anything other than toilet paper. 11. StormsNo refunds will be given for any storm conditions. Gravel and paved roads are well maintained; however, no refunds will be given due to road conditions getting to the property. 12. Hunting and FirearmsAt NO time is hunting allowed. Firearms on the property are strictly prohibited. 13. Arrival and Departure Check-in time is 3:00 p.m.Check-out time is 11:00 a.m. NOTE: "Restrictions apply" does not mean the cabin is unavailable. Cabins are restricted to two night minimum reservations. To reserve a cabin, select the desired check-in and -out dates in the drop down selections above. 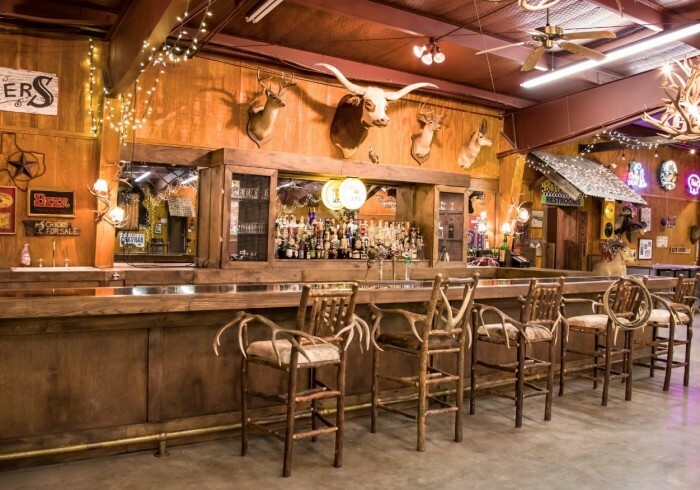 Texas Safari Ranch is a world-class facility located outside of the town of Clifton, just forty miles from Waco, ninty miles from the DFW Airport, and minutes from great restaurants. The ranch is a breathtaking country escape full of exotic wildlife and features a mile-long creek, paved roads, and over 30 ponds. Texas Safari Ranch is capable of facilitating unforgettable parties, family reunions, and weddings for your next corporate or private event. Whether it be the picturesque Western Town, or the wildlife roaming before your very eyes, guests are sure to be amazed!